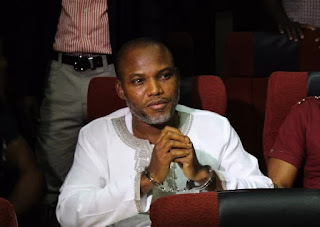 The Movement for the Emancipation of the Niger-Delta, MEND, today, took the the leader of the Indigenous People of Biafra, IPOB, Nnamdi Kanu, to the cleaners, saying he agreed in secret to renounce ‘Biafra’ in exchange for freedom, only to act hypocritically in public after sealing discussion with MEND on the matter. “MEND and the Federal Government have, however, flatly rejected the IPOB/Kanu hypocrisy to remain defiant in public; while accepting to secretly renounce secession. The group argued that the public denunciation by Kanu was important so as not continue deceiving the gullible donors and followers sold to the illusion of a ‘Biafra Republic’ that aims to annex the Niger Delta region as part of its territory.